If you ever had a kid running around in a room with a computer you most likely must have noticed that the little brats seem to be fascinated by the computer lights, buttons, keyboard or mouse. They cannot stop pressing their little fingers everywhere which can lead to some undesired results like powering down a computer or opening an optical drive. Optical drives are sensible and can break easily if enough pressure is applied. 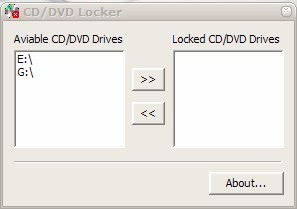 CD / DVD Drive Locker puts an end to this fear by locking selected optical drives of a computer system. The software program is easy to use. Just select the optical drives that should be locked and move them to the list of locked drives with the click of a button. Unlocking works practically the same. While kids - or more specifically parents - are the main target for the application it might also make sense under other circumstances. Could be useful to lock the optical laptop drive to avoid that the drive opens accidentally. Credit goes to Instant Fundas for finding the application. They missed to include a link to the application though. CD / DVD Drive Locker is compatible with Windows XP, Windows Vista or Windows 2000.
do you have any kids martin? Thank you, thank you very much. My kid can´t resist to press the DVD drive. These wonderful application will stop him! My 1 year old loves to turn on the computer (Giant glowing blue button) and open the CD drive (Accidentally pressed it once and has now remembered where it is). This should stop him!